Liverpool's Mohamed Salah celebrates scoring their second goal. 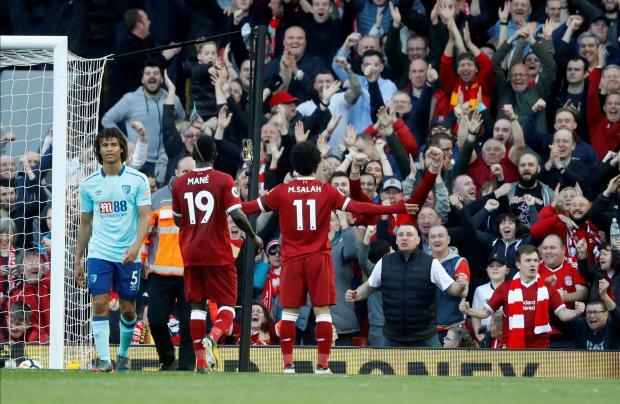 Bournemouth stayed in the game despite Liverpool's dominance but Salah made the points safe in the 69th minute when, with his back to goal, he glanced in Trent Alexander-Arnold's long pass with an astute header. In doing so Salah became only the third Liverpool player to score 40 goals in all competitions in a single season -- joining Ian Rush, who managed it twice, and Roger Hunt. There was still time for Roberto Firmino to add to Liverpool's tally with a late third goal, cutting in from the left and firing a low right-footer past Begovic. Victory lifted Liverpool three points above Tottenham Hotspur who were playing Manchester City later.